An accommodated tour beginning in Chobe and ending in Johannesburg combining Kruger and Zimbabwe including the Panorama Route, game drives and game walks in the Timbavati, cultural excursion in the Limpopo, walks in Matopos, game drives in Hwange National Park, the mighty Victoria Falls, game drives and boat trip in Chobe and finishing up with the wildlife-rich Delta with walks, boating and mekoro excursions. Tour starts on day 1 with a pre departure meeting at 18h00. Our lodge is situated on the banks of the Chobe River. 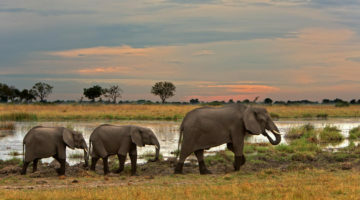 Chobe is famous for its beautiful scenery, magnificent sunsets and abundance of wildlife and birdlife. 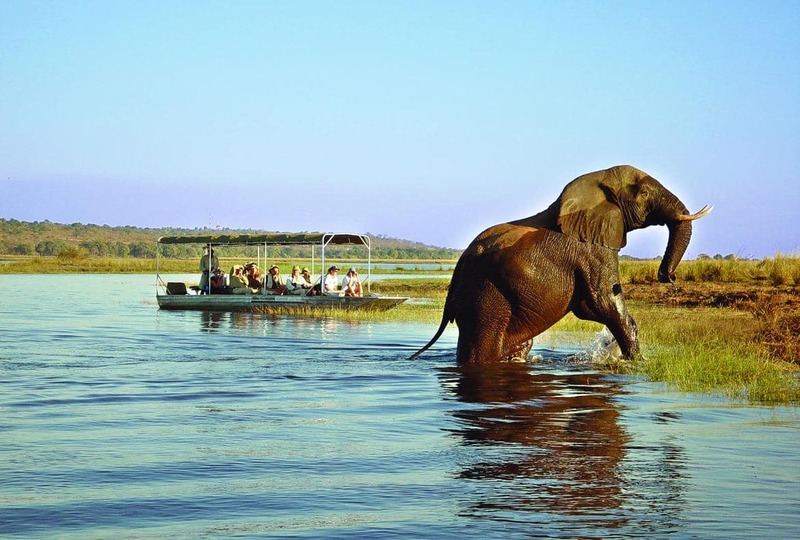 The following day is spent on an early morning Game drive in Chobe National Park and a sunset Game viewing boat cruise on the Chobe River. Crossing into Zimbabwe we travel to Victoria Falls which is without doubt one of the greatest and most spectacular sights in Africa (entrance own account). The days are free to browse the local markets and to experience the many optional activities on offer in the adrenalin capital of Africa including walks with lions, helicopter flights over the Falls, rhino walks, elephant back safaris, sunset boat cruise etc (own expense). Travelling through Zimbabwe we arrive by lunch to Hwange National Park. 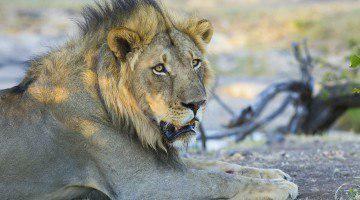 We enjoy a late afternoon open 4×4 vehicle game drive in the private concession bordering Hwange National Park. The following morning we enjoy another game drive in the concession and in the afternoon relax at the lodge or an optional game drive (own expense). Continuing through Zimbabwe we travel to our lodge located on the edge of the World Heritage site – Matopos National Park. The following day is spent on a historic trek to Rhodes grave and walks to renowned caves and Bushman paintings. 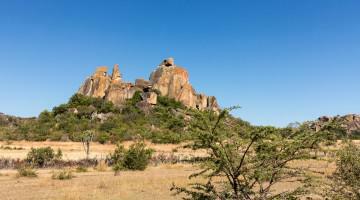 Our lodge is set within the large granite boulders of the Matopos. An early departure takes us through Zimbabwe to the Beit Bridge border post. We travel to our lodge in the Limpopo Province where we experience a taste of the local Venda culture. Day 10 we depart after breakfast for a full day cultural tour which includes a visit to a local village, school, clinic and a traditional lunch. Dinner is enjoyed in Venda style in the local village. Departing after breakfast we enter the Kruger national park through the Pafuri gate. Traversing south we enjoy a full day of game viewing on our way to the famous Timbavati Private Game Reserve situated in the Greater Kruger National Park. Shindzela tented safari camp provides guests with a true safari experience in a private game reserve – an ideal way to make the most of your Kruger safari holiday. We enjoy an afternoon game drive and on Day 12 we enjoy a morning game drive and afternoon bush walk in search of the many animals inhabiting the reserve. Departing the reserve the day is spent viewing the spectacular Blyde River Canyon, Gods Window viewpoint and Bourkes Luck Potholes. Departing after breakfast we proceed to Johannesburg, South Africa&apos;s biggest city and capital of its inland. Tour ends with a transfer to ORT International airport for onward flight home. 14 nights accommodated in hotels / lodges / tented camps. All en-suite. 14 breakfasts, 10 dinners. All lunches own account except where specified. Flights, airport taxes, visa costs, all lunches & dinners where not specified, optional excursions, drinks, mineral water, gratuities and personal expenses. A small intimate lodge featuring 7 luxurious tree houses and 2 Presidential Elephant Suites set on elevated platforms amongst the indigenous flora of Hwange Game Park. Deep in the mystical teak forests of Hwange is this unobtrusive camp, bathed in the tales of pioneering hunters and explorers such as Fredrick Courtney Selous. Lumbering giants drift around your stilted platforms , their tusks glinting in salute to the sanctuary of shade offered up by these massive trees. This is Ivory Lodge – place of elephants. It is here that great herds of elephants are found – sometimes over 100 strong. Hwange is renowned for its huge tuskers – big old bulls with magnificent tusks. It is also here that the famous Presidential Herd drinks – these elephants’ home-range is amongst the dense feeding areas of the Sikumi Vlei and where they find refuge from the scorching heat at Ivory’s water hole. Silently, elegantly, the lodge stands over the waterhole…. watch by flood light under a star spangled African night sky – the elephants in their play-fighting….their display of instinctive rituals, their caressing and murmurings…all which speak of years gone by. The granite domes and castle kopjes of the Matobo Hills, Zimbabwe, are among the most majestic rock sceneries in the world. Nestled in this unique range of hills is Camp Amalinda. Amalinda consists of nine individually thatched rooms including 3 honeymoon suites, which are set into the huge boulders. These 3 suites have just recently been refurbished. Each room is steeped in African historical artefacts of a bygone era and tucked away into an ancient bushman’s shelter, Camp Amalinda’s charm will leave an indelible impression on every visitor. Providing self-catering two-room units, the lodge also has a restaurant and pub, as well as conference and event facilities. Owned by the local Mutele community, Awelani is set in a 1700 ha Eco-Park, where visitors can go on nature walks to see small animals and birds; enjoy the magnificent conservancy, with beautiful baobabs, Mopani and Rock-fig trees (to name a few) and view the local Bushmen paintings. Awelani is ideally situated for day visitors to Kruger’s northern section – only 12km away from the Pafuri gate, cross-border travellers and those visiting the northern parts of Limpopo. We know that an African safari is a very special experience – we invite you to join us for a journey of discovery on a wildlife safari. Shindzela is a small wilderness camp, and hosts a maximum of 16 guests. We focus on game drives in open 4×4 vehicles (day & night drives), and walking safaris. Our bush walks and game drive safaris place an emphasis on understanding the wild environment, and tracking and viewing animals in their natural surroundings. We are able to drive off road in search of African predators and Big Five animals. Situated in the Timbavati Nature Reserve, and part of the Greater Kruger National Park, Our tented accommodation consist of 8 canvas tents set on wooden decks with a little porch, each with their own en-suite bathroom (shower, hand basin, flush toilet). Each tent has got a mosquito net over the bed, and canvas flaps for windows also lined with mosquito nets. Our camp runs on Solar powered lights in each tent and dining room area, and your hot/cold shower is regulated by our gas geysers. Shindzela Tented Safari Camp offers a back to basics, affordable Kruger safari holiday, without compromising on important safari experiences; the thrill of viewing African wildlife, marvelling at a beautiful sunset, or relaxing around the camp fire with a drink. Hippo Hollow Country Estate is situated outside Hazyview on the Sabi River between the Drakensberg Mountains to the west and the low-lying bushveld to the west. It is the ideal destination from which to access the reserves of the Lowveld and the sights of Mpumalanga. Hippo Hollows is only ten minutes from the Kruger National Park and the panoramic route which includes Pilgrim’s Rest, Graskop, Bourkes Luck Potholes, God’s Window, the Blyde River Canyon, and the many fantastic waterfalls of the escarpment is close by. Hippo Hollow Country Estate provides the ideal breakaway from the rigorous of city life. The hotel has an ‘Out of Africa ‘ feel about it, and leaves you feeling totally relaxed and refreshed. The 54 air-conditioned hotel rooms overlook the picturesque gardens with two swimming pools. These include rooms with Twin Beds, Baths and Showers, Air Conditioning, Satellite Television, Ceiling Fans, Tea / Coffee making facilities and a number of inter-leading rooms available. There are 18 River Chalets. These chalets have Twin beds with a Loft with 2 single beds. Each is equipted with Ceiling fans, Private deck overlooking the Sabie River, Double showers and Tea / coffee making facilities. Safari Club SA is a lodge with an African theme located in Johannesburg, South Africa. The Club is centrally situated in the economic heartland of South Africa – Gauteng Province. The capital city, Pretoria, is approximately 50km away and Johannesburg only 18km. Emperor’s Palace, a world class casino with more than 12 restaurants, is only 7km down the road. The well-known Pilanesberg area with its nature reserves and Sun City complex is 150km by road and it is 400km to the world-renowned Kruger National Park in Mpumalanga. The Club has a luxurious yet homely ambience. The public areas comprise lounges, a bar, a business centre as well as a separate breakfast room. A beautiful new swimming pool has been installed to ensure the comfort and relaxation of guests during the hot African summer. The bar is decorated as a tribute to the famous Nguni cattle and adorned with beautiful fittings in this theme.